For Jon Meacham’s visit to the house today, I needed a large, colorful arrangement for the entrance hall. After all, what better way to greet the editor of Newsweek Magazine and the author of the bestselling American Lion: Andrew Jackson in the White House? Anne Schomaker, a friend and professional flower-designer, volunteered her considerable skills for the job. 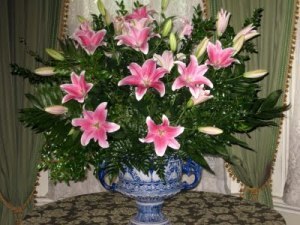 Would you like to see how she transformed my blue and white Chinese porcelain urn, above, into a masterful picture of fragrant pink lilies and handsome greens? 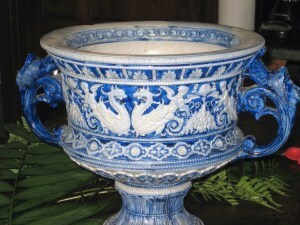 Large bowl, vase or urn. Assorted greens. For this project, Anne selected 7 stems each of leather fern, palm-, and huckleberry- branches. Your neighborhood florist can usually provide these. One dozen Star Gazer lilies, with 4 unopen buds on each stem. Soak the lilies in a bucket of water overnight, set in the warmest room of your home. This will cause most of the buds to open. Always remove the pollen-tipped stamens from open buds — the pollen, as it falls, tends to stain whatever it touches. 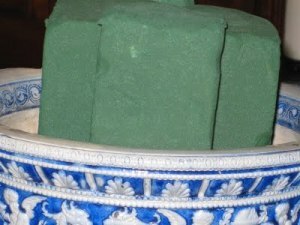 Soak oasis in water, until the blocks have absorbed all the moisture they can. Then insert the blocks into your chosen container. Into the oasis, insert the greenery, always aiming for a fan-shape. You can not possibly have too many greens for a large-scale arrangement. Once all of the greens are in place, the oasis blocks should not be visible. Insert lilies. For stems with one or two open buds, and an equal number of closed ones, insert with closed buds to the rear. This, says Anne, will keep the stems from shifting forward. Continue adding lily stems throughout the greens, always striving for a balanced effect. 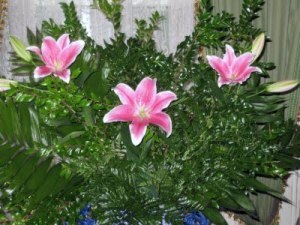 If the arrangement is displayed in a room that is neither hot nor dry, and fresh water is added daily, the lilies will last for about a week. The greenery, however, will last much longer. My own special trick with such an arrangement is to remove the flowers as they fade, but to keep the green foundation intact. Then it is easy enough to replace old flowers with new. 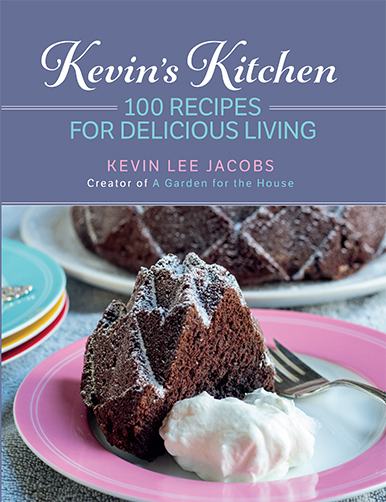 For more gardening and decorating tips, sign up for Kevin’s weekly newsletter. The flower-arrangement is breathtaking, and yes, I'd like to do something similar, using glads from my garden instead of lilies. Now, I have a question to ask: where does one get oasis blocks? I've never seen them in garden centers. Kevin, I'm not sure which I like better: the flowers or the beautiful urn! Sally – Glads and greens? Sounds good to me! Your local florist or crafts shop will have Oasis. Justin – That urn is one of my prized possessions. A friend gave it to me about 12 years ago, and it has held many handsome flower arrangements since that time. I love your idea of “recyling” the greens. Both the arrangement and your entrance hall look divine. 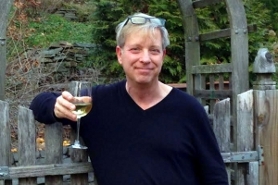 I am hosting a big event at my house in Philadelphia in a few weeks. I'd love to do this arrangement. I wish you and your friend Anne could come on down to help. Why was Jon Meacham visiting your house? Susan – you might try to make this arrangement yourself. Your local florist will have all of the materials you need. About Meachum: he was here for a reception, prior to a book signing event in the area. Thank you all so much for your very kind comments. Kevin's vase is uniquely beautiful as is the table and draped window space where this arrangement was placed. As Kevin suggested, soak the oasis block until saturated and fit in into the vessel of choice. Green it thoroughly. 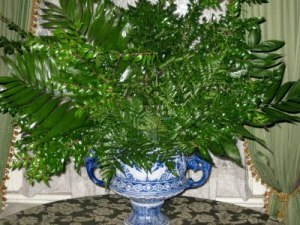 Outdoor braches such as pine, holly, hosta, peony leaves, etc. work just as well. Then add your flowers. PS A drop of bleach in the water will help keep bacteria under control so that your flowers last longer. Enjoy your beautiful creation. Thank you for the tip concerning stems with unopened buds, and keeping them in back. It's always annoying when buds open and stems shift, making the arrangement look off-kilter. Kevin, that arrangement is stunning! Thanks for the “you-can-do-it-too” tips!